L.M. Montgomery wrote, “I’m so glad I live in a world where there are Octobers.” We’re not sure if Montgomery was an orienteer but we tend to agree. For most parts of the USA, October is pretty much the perfect month to orienteer. 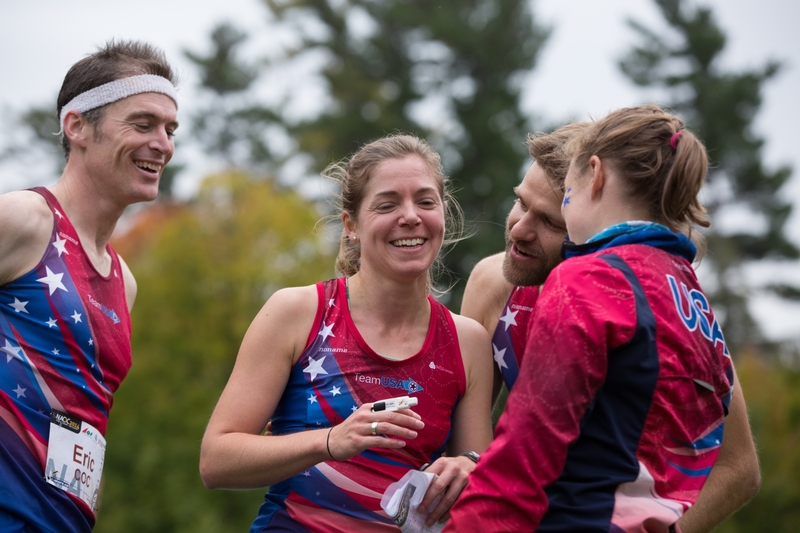 Team USA excelled on the field of competition at the recent North American Orienteering Championships in Arnprior, Canada. The event was highlighted by our Senior squad successfully defending its hold on the Kjellstrom Cup and our Junior squad winning the Future Champions Cup outright. American women swept the Long race with Samantha Saeger, Kseniya Popova, Alison Crocker as 1, 2 and 3. Sam was also 2nd in the Middle distance, and then was 1st in the sweep of the Sprint with Tori Borish and Alexandra Jospe taking 2nd and 3rd. Our Sprint Relay teams took 1st, 2nd, 4th and 5th. On the Junior side, they won the Sprint Relay. In the Individual Sprint, Isabel Bryant and Will Hubsch both earned silver. Isabel won gold in the Long and Middle with Addison Bosley and Morgan Rabalais (USMAOC) winning 2nd and 3rd in the Long and Matej Sebo winning gold in the Middle and Melanie Sergiev winning silver in the Middle. Great results from a great team. We thank Orienteering Canada and the Ottawa Orienteering Club for hosting a topflight international meet. The next North American Orienteering Championships will be held in the USA in 2016. Congratulations to Alexandra Jospe (Cambridge Sports Union & Team USA) for her stand out performance at the US Individual Orienteering Championships hosted by the Rochester Orienteering Club. Approximately 400 orienteers competed over three days in upstate New York. Alex won the US Champ gold medal in the Sprint and Long races and the bronze medal in the Middle race with Kseniya Popova winning gold. The US Champs in the men’s division were: Sprint & Middle - Sergey Ryzhkov (Delaware Valley Orienteering Association). Long – Eric Bone (Cascade Orienteering Club & Team USA). Thanks to the initiative of the host Rochester Orienteering Club, a newly devised club competition was developed. Based on club size, the inaugural winners were: AAA – Quantico Orienteering Club, AA – Empire Orienteering Club and A – Cambridge Sports Union. A full write up of this competition will appear in the November/ December issue of Orienteering North America magazine. Funded by IOF and OUSA, Magnus Wallenborg (IOF MTBO Map Commission & Swedish MTBO National Coach) and Greg Lennon (OUSA VP Clubs and MTBO Director) spent ten days crossing the US. There were four MTBO events and six public presentations, and over the course of crossing 18 states and driving 4,500+ miles, they also assessed nine different terrains for potential national or international event potential. Most importantly, they met with enthusiastic mountain bikers, adventure racers and orienteers. Numerous ideas were exchanged, great MTBO terrains were definitely identified for future events, and at least two future Team USA athletes are likely to join the existing Team members and club volunteers working together to help develop the sport across the US. Orienteering USA Annual Competitive Awards Program: The Program’s goals are to recognize and reward outstanding competitive accomplishments by US orienteers at the end of every year. The Program’s Committee solicits nominations from Orienteering USA membership for several different awards: Orienteer of the Year, Junior of the Year, Comet of the Year (the person who has improved greatly on the national and/or international stage) and the Team of the Year. A full description of these awards and how to make a nomination as well as a list of the past winners are online here. Nominations are due by Nov. 20th, which is one week after the Nov. 14 - 16 Relay and Night-O Championships that form the core of the Long Day's Night A-Meet. Did you know that approximately one out of every three dollars used to run OUSA comes in the form of donation; and that 100% of every dollar is used to drive the mission of OUSA? You do now. The board of directors of OUSA is making their annual fund appeal and we rely upon your generosity the help promote and grow the sport of orienteering. Shortly you will see ads and envelopes in the October and November/ December issues of Orienteering North America magazine. Please take a minute and remember OUSA. Or you can save a stamp and give online at www.orienteeringusa.org and click on “Support Orienteering”. Finally, the board asks that you consider making your gift, or a portion of your gift, “Undesignated” - this allows the board to spend the funds based on greatest need or opportunity. OUSA thanks you for your continued support. Direct links to most of these meets can be found 24/7 on the OUSA National Event webpage. Discover Orienteering. Discover The Joy of Orienteering in October. Copyright © 2014 Orienteering USA, All rights reserved.